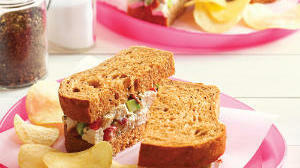 Get fresh bread and make a yummy sandwich with chicken, turkey, lamb, or seafood. The sweet, delicate flavors of fresh crab and bay shrimp shine in simple recipes like this one. A bouquet of herbs, plus lemon and cucumber, blend with the meatiness of roast chicken to make a stellar sandwich. Using a crisp cucumber is key; it keeps the croissants from getting soggy. The classic club-sandwich combo of roasted turkey, smoky bacon, creamy avocado, and sweet, juicy tomato is even better when you toss it with a creamy lime dressing. This tasty spin on the ordinary mayo-celery tuna salad was inspired by the Sicilian tuna sandwich at the San Francisco branch of ‘Wichcraft, a New York sandwich shop. Roasting summer produce ― eggplant, tomato, zucchini, and peppers ― on a baking sheet on the grill yields silky, melt-in-your-mouth vegetables. We tuck them into pita pockets with or without chunks of skewer-grilled lamb.